Kona has a long heritage in steel hardtails. The 2018 Explosif is a direct descendent of Kona’s original steel line-up. Steel provides an exceptional ride quality that just can’t be achieved with carbon or aluminum. Kona pulled out all the stops to spec the Explosif with a truly elite-level build kit. Smoothing out the trail on the front of the bike is a Rock Shox Revelation RC with 120mm of travel. The Revelation features an air spring which can easily adjust the compression of the fork and a rebound adjuster to control how fast the fork bounces back. Powering the bike is SRAM's GX Eagle drivetrain. The Eagle provides 12 speeds featuring a wide range of gears that will effortlessly take you up climbs and power you down descends. The Explosif rolls on WTB wheels wrapped in Maxxis tires and both are tubeless ready. A tubeless setup allows you to run lower tire pressures to increase traction without running the risk of receiving pinch flats. In the rocky world of mountain biking, tubeless is the way to go. If you are looking for a hardtail to shred at your local trail network, treat yourself to a Kona Explosif. Experience the incredible ride quality of steel and shred with confidence knowing your bike has an elite-level build holding it together. 175-188 cm 6'1" - 6'5"
Steel is real. Won't beat you to death like aluminum hardtails. What does a size L weigh? How wide a tire can one run in the back? I run a 2.4 Maxxis Ardent on a 29 mm inner width rim, no problem. 2.5 might fit but would be tight. 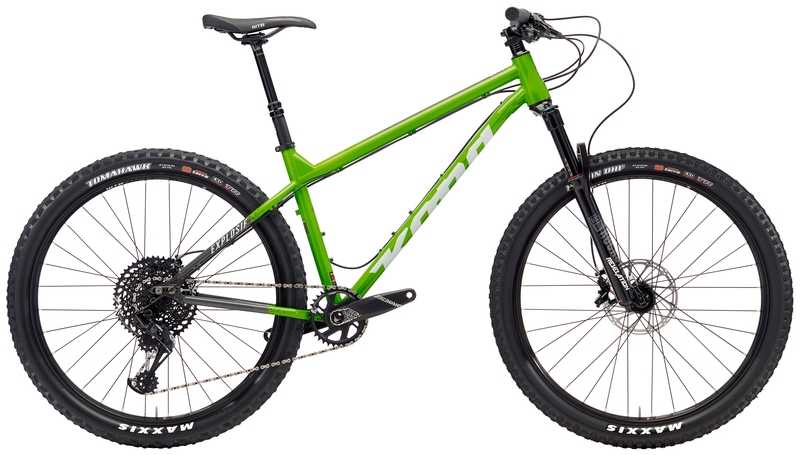 What's the rear spacing of the frame? What's the largest travel fork i can fit on this bike size large?